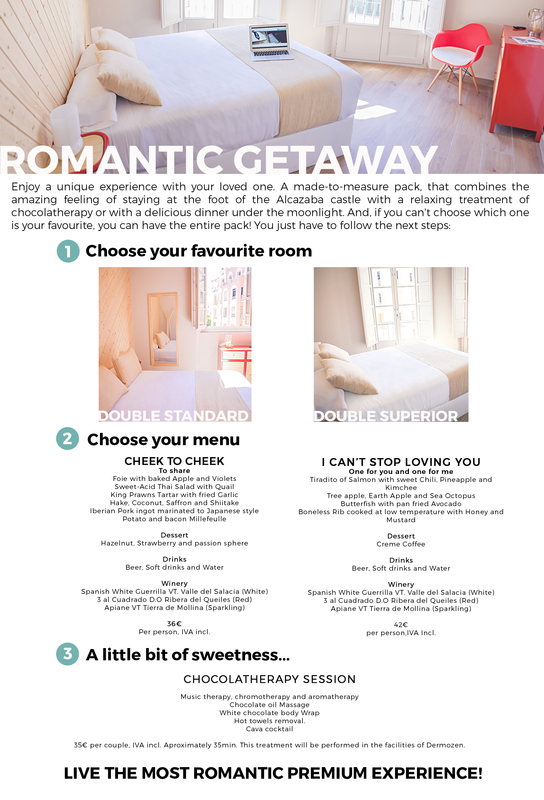 At our design hostel we think of everything and, in this occasion, we want love to prevail… That is why we have prepared a special offer for you to enjoy an unforgettable romantic getaway with your special one at Alcazaba Premium Hostel. Our offer will allow you to enjoy a delicious romantic dinner under the moonlight, in an incredible location beside the Alcazaba of Malaga, then finish off the evening in one of our double rooms only to wake up surrounded by the magic of Malaga’s old downtown. And if you want to add more passion into the mix, you can enjoy a sweet session of chocolate therapy with your partner in a special facility located just a few meters away from the hostel. The session includes music therapy, chromotherapy, aromatherapy, a massage with chocolate oil, covering in white chocolate and champagne cocktail… There’s hardly a better occasion than a romantic getaway to get yourself covered in chocolate! Hard to say no, wouldn’t you say? The offer does not end here, you can customize your getaway and pick the type of double-room (standard or superior) and the menu of your choice… We have prepared two exquisite special menus that will make anyone fall in love: with Cheek to Cheek, you will share as good lovers six succulent dishes and a dessert full of passion, and with I can’t stop loving you, each of you will enjoy three delicious courses and a dessert… All of this accompanied by the best wines and a wonderful atmosphere. Check out our offer here to get more details on the options and choose your custom romantic getaway. Do not wait any longer! It will only be available during February and March and until April 18th, with the exception of Easter Week (from March 21 to 27). You can still make your reservation for Valentine’s Day, but hurry up! There are limited places!